The Georgian conflict poses major challenges for governments and companies seeking to find ways of transporting Caspian oil and gas through the South Caucasus to European and Mediterranean markets. Three pipelines that run through Georgia are now out of action. A cluster of major pipelines pass through Georgia, some of them within a few kilometres of positions occupied by Russian forces before Moscow declared its own ceasefire on 12 August. At present, these do not appear to be particularly threatened by the recent conflict (although all three are temporarily closed, one for reasons unrelated to the conflict. the other two as a precautionary measure). What is at stake is the raft of plans for new pipelines and the major expansion of existing systems. The biggest doubts concern the future of gas transportation. At present, the existing Baku-Tbilisi-Erzurum pipeline (BTE) carries some six billion cubic metres of gas a year (bcm/y) to Turkey, some of which is then forwarded to Greece. As Azerbaijani gas output grows, the line should reach its full 20 bcm/y capacity by about 2014. The European Union is also backing proposals for development of essentially parallel lines to carry as much as a further 30 bcm/y of gas from Turkmenistan, and perhaps Kazakhstan. The EU calls the route through Azerbaijan and Georgia its "Fourth Corridor" - matching existing supply systems from Russia, Norway and North Africa - with concept projects such as the planned Nabucco pipeline from the Georgian-Turkish border to Austria seen as ways of implementing it. Because transit through such a corridor bypasses Russia, it offers advantages to both Caspian producers and European consumers. Producers gain direct access to end-consumers at market prices, whereas at present Russia buys gas from Central Asia at one price, and then sells gas to Europe at much higher prices, the difference being far more than pure transportation costs would merit. Consumers gain because bringing new competitors into the European market subjects Russia to increased competition at a time when it furnishes almost half of Europe's gas imports, which last year totalled around 280 bcm/y. The demonstration of Russian power - officially exercised to protect Russian passport holders in Georgia's breakaway territory of South Ossetia - will be noted carefully by Caspian energy producers, notably Kazakhstan, where about 30% of the population is still ethnic Russian. Russian pressure on Caspian producers to use Russian routes for their exports is now likely to be intensified. At the same time the efforts of western companies to raise finance for major projects in the South Caucasus will be made much harder. In terms of existing supply routes, however, the impact is likely to prove far more limited. 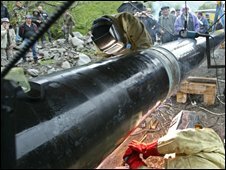 There appears to be little threat to the bulk of existing oil supplies through Georgia, but the damage done to the country's reputation as a safe place for expensive and extensive international energy infrastructure is potentially very considerable indeed. Three major lines currently transit Georgia. The biggest is the 1.0 mb/d capacity Baku-Tbilisi-Ceyhan (BTC) pipeline, which carries crude oil from Azerbaijan to the Turkish Mediterranean terminal at Ceyhan, from whence it gets transported by tanker to both Europe and the United States. It has been out of action since 5 August, due to a fire. PKK Kurdish insurgents claimed responsibility, saying they sabotaged the line. Repairs are now completed, but pumping has yet to resume. The main damage to BTC is likely to be to proposals to expand the line's capacity so that it can handle as much as 1.8 mb/d of crude. One question how keen Kazakhstan, the source of much of the projected 800,000 b/d of input, will be to pursue this export route. The next major line is Baku-Supsa, a 150,000 b/d line that has just reopened after undergoing substantial renovation. It carries oil to the Black Sea, but the port of Supsa is just 25 kilometres from Poti, the port which handles most of Georgia's imports and which was bombed and shelled by Russian forces. In between Poti and Supsa is Kulevi, an Azerbaijani-owned terminal where Kazakh and Azerbaijani crude oil is unloaded onto tankers after transitting the South Caucasus by rail from Baku. Azerbaijan and Kazakhstan had ambitious plans to expand rail traffic, pipelines and terminals in Georgia, both at Kulevi and the southwestern port of Batumi. These may now be in question. In sum, the vast bulk of the oil and gas systems operating before the Georgian conflict should — so long as the ceasefire holds - be back in working order within weeks, if not days. Rail traffic may take longer to recover, depending on damage sustained by Georgia's internal infrastructure. But the real blow is to Georgia's reputation. The last few days have just proved that so-called "frozen conflicts" are simply ice-covered volcanoes. Protecting existing investments in such a climate is one thing; raising further investment to build new lines or expand existing systems is quite another. John Roberts is the author of the forthcoming book Pipeline Politics: The Caspian and Global Energy Security.